Positive pressure ventilation is now the mainstay of firefighting departments across the US. As with many innovations, it grew out of a strong firefighting culture in California, a state known for its extensive experience fighting wildfires. Historically, mechanical ventilation was considered an essential tool for firefighting. Back in the 1950s, firefighters used air blowers to control backfires during wildfires, and in 1960, several large air blowers were used to fight a refinery fire in Santa Fe Springs, CA. While it was apparent that mechanical ventilation was a powerful firefighting technique, it had limitations when it came to fighting structural fires. At the time, mechanical ventilation meant hanging or holding a smoke ejector inside a structure at a window or other opening to pull smoke out of the building. This was a slow, painstaking process to say the least, increasing the exposure time inside the smoke-filled environment to setup the equipment. Throughout the 1960s and early 1970s, building materials were changing. More plastics meant more toxic vapours and hotter fires, which made it imperative for firefighters to find a way to clear the air more quickly. Smoke ejectors were clearly not up to the job. But something was still missing. Blowers were placed near the entrance of the structure, blocking firefighters and slowing down rescue operations. Airflow was weak, and materials were vulnerable to heat and smoke damage. Meanwhile, ballooning was quite popular in Southern California. 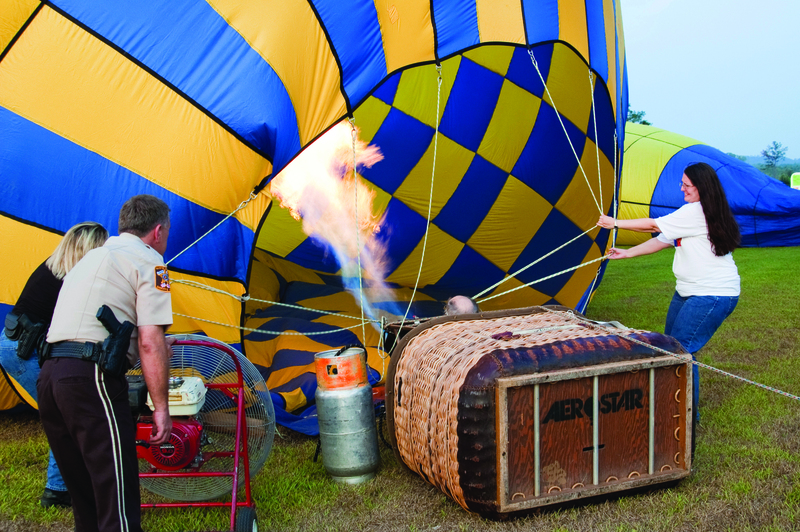 It became clear that blowing up these enormous balloons could be a faster, more efficient process. Typically, an operator had to monitor the blowup process, and put up with blowers that vibrated and operated inefficiently. Enter a balloonist named Don Hamman. He needed a blower that would inflate his enormous hot air balloons without someone holding the fan, so he designed a blower that did just that. Hamman saw the potential for this fan beyond ballooning, as did his grandmother. She heard that a fire department in Bakersfield, CA was experimenting with a firefighting technique they called positive pressure ventilation. Hamman worked with them to adapt his designs to firefighting applications. Now there was a fan with the power and stability to take PPV to the next level. By the late 1980s, PPV fans were a staple of firefighting in several states, including California, Utah, Texas, Connecticut, Maryland, and Florida. With the continued popularity of PPV as a firefighting strategy, more research in the field yielded improvements and evolution in airflow, materials, and technology. In addition to composite blades that proved stronger and more resistant to heat, air straightening became a revolutionary new design in PPV blowers in 2010. Traditionally, PPV fans produce a spinning airflow. This swirling motion causes the air to quickly spiral outwards, losing its punch after 2 to 3 meters. This tight operating zone has been the norm since PPV was introduced to the fire service. “Move the fan closer,” was the mantra, to cover the door with the cone and get the airflow up. By contrast, air straightening creates a long, straight airstream that can ventilate a building from 2 to 6 metres from the entrance without losing its effectiveness. Think of it as the difference between a fog nozzle and a straight stream nozzle. The fan’s stator vanes shape air into a tight, straight beam that pulls in the air along the beam’s path as it travels. This focused flow results in high air volumes into a structure while not obstructing access or introducing an excess amount of fan noise into the interior. Greater setbacks and decreased noise transmission while maintaining high volume flow rates, translate into safer operations, lower noise levels, easier egress and ingress, and more overall flexibility. Firefighters worldwide now recognise the practical limit of the normal 45-55 cm truck or engine carried blower. Structures larger than 500 to 1000 m2 are difficult to ventilate with such small blowers, especially when the structure is more a voluminous space than a compartmented domicile. When confronted with schools, nursing homes, warehouses and such, the standard PPV blower is not up to the task. Ranging from 20 hp up to 120 hp and 100,000m3 to 240,000m3 various Large Structure Ventilators (LSV), are being marketed to the fire service with the power needed to address the large structures that are proliferating. 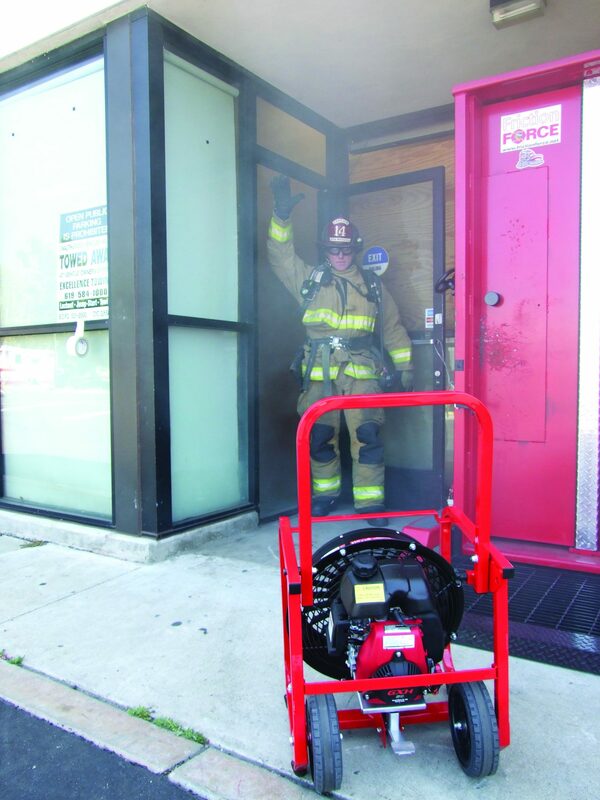 These larger fans now give fire departments the ability to apply the advantages of PPV to large structure fires, from high-rises to big box stores and warehouses. By incorporating air straightening into their design, some of these mobile fans have the ability to reach entrances from as much as 10 or more metres from the ingress. Such setbacks from the entrance are overcoming the limitation of the lack of mobility of earlier designs allowing firefighters to move unimpeded through building entrances. With tilt options or other arrangements, LSVs can be used on multi-story buildings with great success. PPV blowers are predominantly powered by gas engines or electric motors. Electric motors are quiet and carbon monoxide (CO) free, but lack the muscle required for larger structures and, of course, require a generator. Gasoline engines are notorious in exhausting carbon monoxide, which in turn gets carried into a structure. Heavily diluted by the air from the blower, readings of above 50 PPM can be obtained, mostly during training, but also during those times engine speed is reduced. 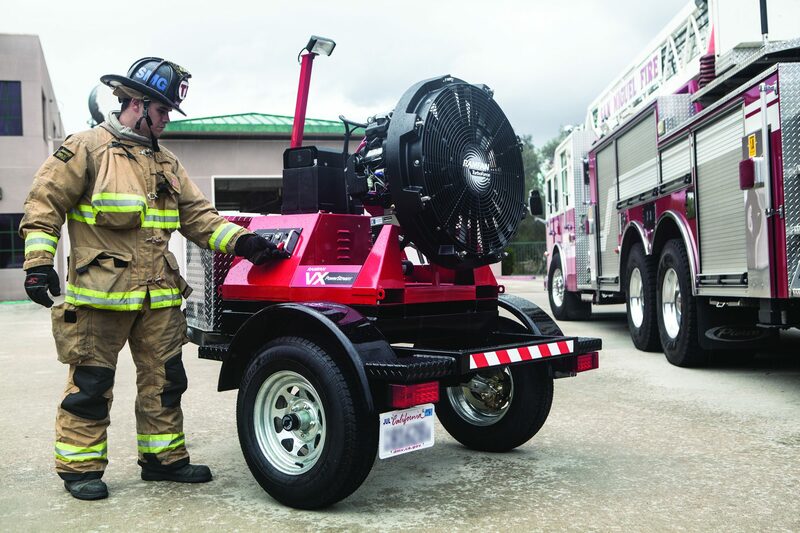 Unfortunately for all, electric motors have a practical deployable limit of 2 hp for the majority of fire apparatus, leaving the larger blowers to be gasoline engine powered. The US Environmental Protection Agency (EPA) has shown that small internal combustion engines increase pollution-related urban health problems, while government agencies are publishing guidelines, and even regulations, as to the maximum exposure time to CO by all workers, including firefighters. That’s why reducing gas engine emissions, especially CO, is crucial for firefighter safety and air quality. In California, manufacturers receive special certification for minimising or eliminating small engine emissions. In trying to address these market realities and concerns, manufacturers of PPV and LSV equipment are borrowing a page from the auto industry and experimenting with catalytic converters to alleviate the concerns. At full throttle, some of these devices are capable of reducing the CO component of exhaust to a point that it is undetectable inside of the ventilated structure. Infrared (IR) thermography, commonly referred to as a TIC (thermal imaging camera), is opening up another avenue of safety for firefighters. Besides their well documented use in locating victims through smoke and heat, the devices are proving useful in sizing up heat load and heat migration during PPV or more significantly PPA (positive pressure attack) operations. An important concern during a PPA exercise is to properly locate the egress for the heat and smoke to leave the structure. This is the responsibility of the scene commander to size up the situation and determine the proper location of equipment, personnel, ingress and egress points and to control the sequence of events. Using the TIC as an integral part of the PPA operation, not only can the amount and location of heat be determined, but the dynamic three-dimensional movement of the heat load towards the egress can be visualised and analysed for appropriate cause and effect. Such feedback is vital in insuring firefighter safety as the operation progresses. During training of firefighters, the TIC becomes indispensable for creating a visual image in the mind of the trainee depicting the cause and effect of changing the ventilation variables. It’s an exciting time for PPV and LSV development. Innovations continue in PPV and LSV design and operations as building techniques change the combustible materials in structure fires. Plastics and other synthetic materials burn hotter and are more toxic, making larger capacity blowers more critical than ever. Consider that the energy released during combustion of a typical structure and its contents has increased by four-fold in the last 30 years, as the materials we use to produce our fabrics, carpets, furnishings and fixtures have changed from organic materials such as cotton, leather and other natural fibres, to synthetics derived from the magic of the chemical and petrochemical industries. What makes our lives easier complicates that of the firefighting environment. This creates an ongoing challenge for firefighting industry and its suppliers, including those creating ventilators. How do we maintain outstanding safety records, improve survival rates and remove toxic fumes and smoke quickly? We’ve got the tools. But the tools will only function at their highest potential if the training is there. The importance of including PPV and LSV operations into every standard operating procedure (SOP) is critical. This can’t be emphasized enough. And that’s not just hot air.